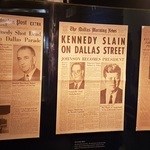 It was our first visit to Texas and we were arriving in Austin from Houston. 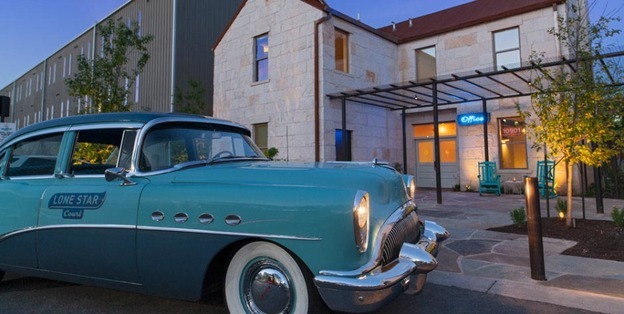 We’d found what sounded like the perfect place to stay in the state’s capital: Lone Star Court. Does that sound like the perfect Texas hotel or what? However, the GPS was not cooperating and, set to avoid toll roads, it was taking us off the freeway then sending us back on only to take us off again. We ended up in a shopping mall. This cannot be right, we thought. It was right, as Lone Star Court is in the unlikely – but what proved to be wonderful – location of The Domain shopping mall. Drive past the classic car outside the office door and you step into another world. 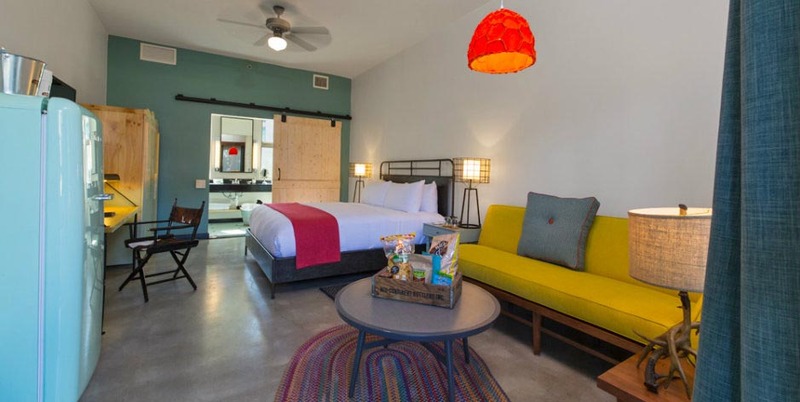 It looks like you’re entering a cross between a motel and a western fort, but it is in fact a stylishly-designed new boutique hotel built in the retro style of an old-fashioned American motor court. It also references Texas’s Spanish heritage, in the way that Spanish houses turn their back on the world and look inward to a central courtyard. 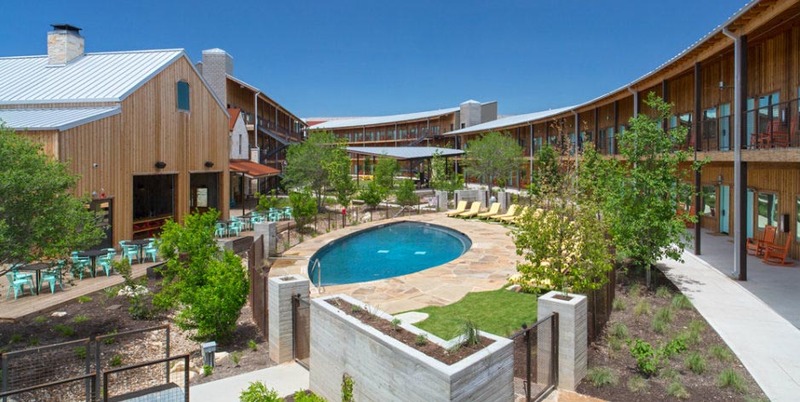 Instead of a fountain, the Lone Star courtyard’s focus is a swimming pool, with walkways through the growing greenery, several fire pits scattered around, and two or three tiers of rooms whose doors also face inward onto the courtyard. 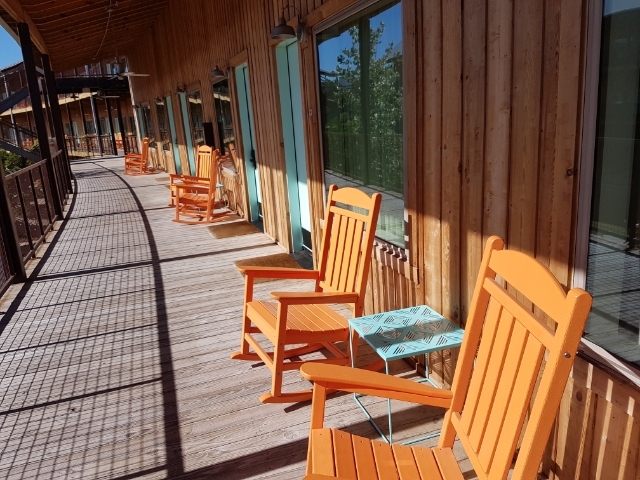 There are bright orange Adirondack chairs outside each of the rooms, and within five minutes of arriving the freeways and shopping mall have been kissed goodbye, you’re checked in, the bags are dumped and you’re sipping a cocktail on the bar’s outdoor patio as the warm Texan sun goes down. 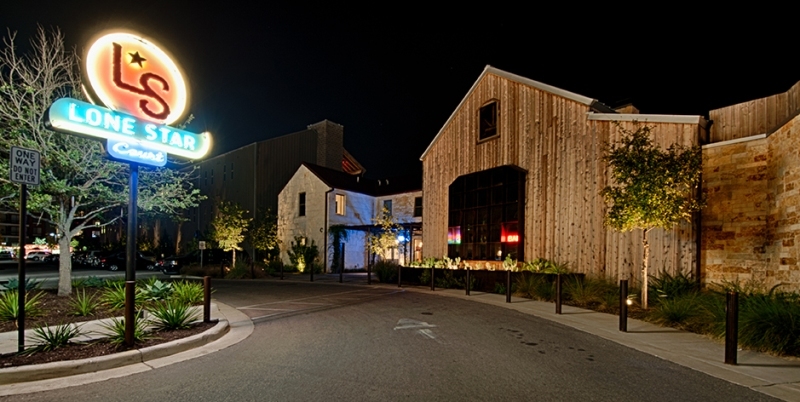 The Lone Star is the kind of place, though, where you’re also happy to hang out in your room. Each is a work of retro art, with the kinds of colour – bright orange, lime green, turquoise – they just don’t use any more. It’s done in a fun rather than an overkill kind of a way, though. There’s a giant 1950s-style SMEG fridge, which turns out to contain the biggest mini-bar I’ve ever seen in my life. A bag of Texas snacks awaits each guest, with a few fun additions like an instant hangover cure. At the far end of the room from the door onto the courtyard, and running the full width of the room, is the bathroom. This is cleverly designed with sliding barn doors which can stay open to let natural light from the large frosted windows fill the room when the bathroom’s not in use. Retro doesn’t extend to the amenities, however, as rooms also have iPad/iPhone docking stations, 42″ TVs and Katz coffee makers. 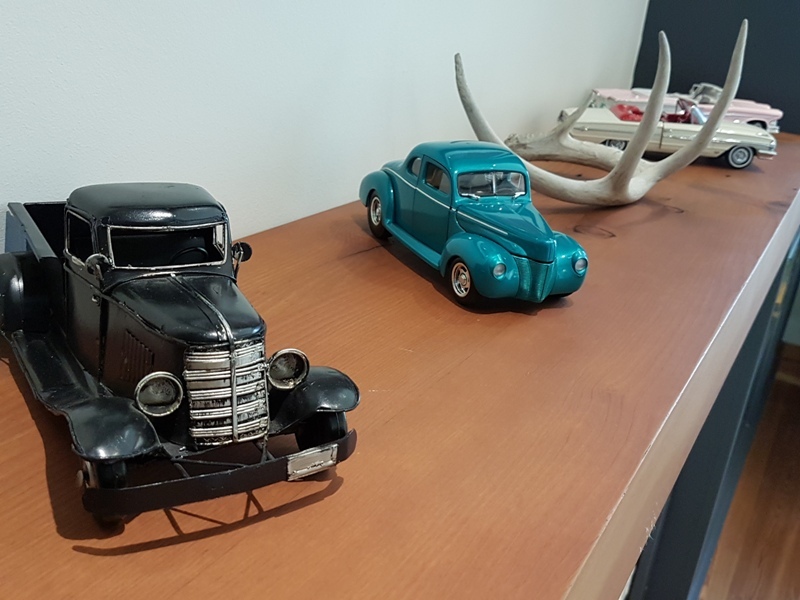 It shouldn’t be surprising that style is at the heart of the hotel (the reception area features neon signs, an old record player and toy cars along the mantelpiece) as it was designed by one of the world’s leading design companies, Rottet Studios. Based in Houston and founded by Lauren Rottet, the company has been responsible for The Beverly Hills Presidential Bungalows, The St Regis Aspen Resort in Colorado, The James Royal Palm in Miami Beach and both The Surrey Hotel and Loews Regency Hotel in New York. They’ve also forged a link with the Valencia Hotel Group, which is also based in Houston, and designed several of their hotels throughout the Lone Star state. This hotel being in Austin, which calls itself the Live Music Capital of the World, Lone Star Court has live music every night from Wednesday to Saturday in The Water Trough bar/restaurant, but with unfortunate timing we were there Sunday and Monday. Food trucks also turn up regularly, to give guests an alternative to the Water Trough, although the advantage of being located in The Domain is that there are a couple of dozen dining alternatives close by, from pubs and wine bars to grills and fine dining. 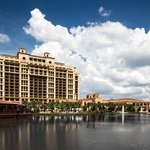 You don’t even need to walk or get the rental car back out, as a complimentary golf cart shuttle service will whisk you from door to door around The Domain. And if there’s any better way to end a night out than being with a bunch of friends going back to your hotel on a speeding golf cart while the sound system blasts out Sweet Home Alabama and late-night shoppers stop to laugh and take your photo, then I’d like to know what it is. And there was still time to sit by the pool and enjoy a round of the hotel’s signature cocktail, the Chill Cowboy. That’s vodka infused with sun tea, some hibiscus liqueur, peach purée, lemon juice and a dash of honey syrup. It’s refreshing, full of contrasting flavours, and has a distinctive kick. Just like the Lone Star Court. Get more information from the official Visit Austin website. Check room rates on the Lone Star Court website. Austin is about 180 miles west of Houston and 200 miles south of Dallas, both of which have international airports. 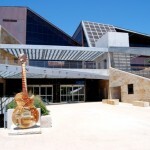 There are also direct flights from London Heathrow to the Austin–Bergstrom International Airport with British Airways. Fly-drive holidays in Texas are available through Trailfinders.